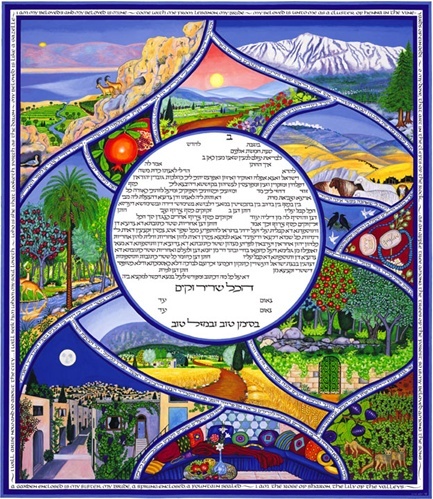 the English writing around the Ketubah (and the Hebrew within it) indicate, this Ketubah is a "collage" of scenes and elements from that most beautiful and sensual love poetry, the Song of Songs. 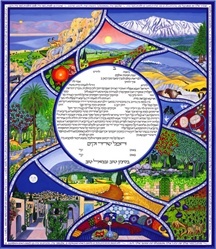 What I tried to do is visualize and then paint the images and metaphors that the text evokes for me, focusing mostly on the landscapes, the fauna, and the flora of Israel, my beloved home country. Below, I quote most of the verses I referred to in my painting, so that if you like, you can use them in your ceremony. The translations are from the 1917 edition of the Jewish Publication Society, with slight modifications of my own, to fit my understanding of the original Hebrew text.